Our success in analyzing the EUR/USD forex pair continues. 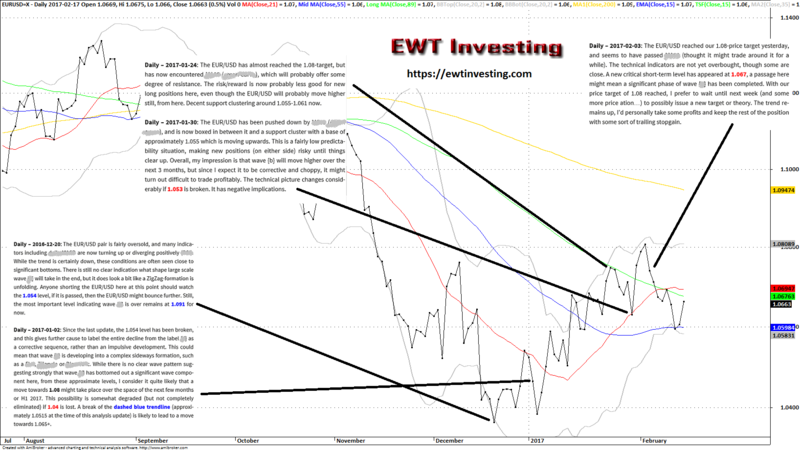 Before the EUR/USD declined considerably during the latter part of 2016, we informed our clients of the considerable decline to come, as covered in this blog post: https://ewtinvesting.com/2016/11/28/track-record-eurusd-2016-11-28/ . Some time has passed, and with it some market phases, and so it’s time for a news summary of our latest EUR/USD analysis updates, this time for the period ranging from late-December 2016 up to early February 2017. On December the 20th 2016, we noted that significant positive technical divergences were building (noting than these conditions were usually seen at significant bottoms), and that with the EUR/USD being very oversold, this was a questionable time to be short (negative positions) the EUR/USD. While we didn’t unequivocally call a bottom, the EUR/USD did in fact end the downtrend that same day. We also noted the important 1.054 level, noting that a passage of it would likely terminate all immediately negative scenarios. On the 2nd of January 2017, we became slightly more bullish, and set 1.08 as a very probable target for H1 2017. We also noted that a loss of the 1.04 level would be somewhat negative, but that a break of a falling trendline (not shown in this chart) at 1.0515 and declining, would be bullish and point towards at least 1.065+. The next few days, the EUR/USD briefly took out 1.04, but then turned around and traded strongly through the falling trendline (which was at 1.051 by then), triggering the positive scenario with a primary target of 1.065+, and the EUR/USD then proceeded to trade upwards to our 1.065+ goal, hitting it a short while later on the 12th of January. Approximately two weeks after that, on the 24th of January, the EUR/USD hit significant resistance at 1.075, close to our 1.08-target, and we warned that this was a bad time to initiate new long (positive) positions in the EUR/USD. We pointed out the existence of a strong support cluster around 1.055-1.061, which the EUR/USD proceeded to test shortly thereafter. On the 30th of January, as the support was being tested, we became decidedly less clear regarding the short-term pattern clarity, however reiterating our underlying belief that the EUR/USD would move higher over the next few months. In fact, the support cluster we’d pointed out actually held, and the EUR/USD proceeded to take out 1.08 shortly after that, ironically, with us less certain than before, that it would happen so soon. On the 3rd of February, we noted that our 1.08-price target for H1 2017 had been hit, and that while strongly overbought conditions weren’t present yet, it would be appropriate to take profits on any existing positions and keep the remainder running with a trailing stoploss/-gain. Summarizing our late-December-early Febraruy EUR/USD analysis updates. So how did we do? It’s safe to say we more or less called the bottom area where the downtrend in the EUR/USD was terminated in January, however, it would be dishonest to say we nailed it at the exact price level the decline stopped, because our trailing positive signal level was only trigged at approximately 1.051, and the decline actually stopped at approximately 1.038. However, our price target at 1.065 was hit and surpassed shortly after our positive trigger was surpassed. It’s then fair to say that we were on target all the way up to 1.075, a significant potential trading profit, counting from our first signal at 1.051. From there on out, more specifically from the 30th of January, it wouldn’t be fair to say we called the last advance to 1.08 clearly from a trading perspective, because market clarity dropped for our methodology, and at that time, we only noted that we expected a choppy move upwards over the next few months. From a macro-wave perspective, we were right. So, from 1.051 to 1.075, more or less, we were on target. Not bad at all. In fact, potentially very profitable. The future moves of the EUR/USD? It’s important to note that market predictability varies over time. This is a core component of our methodology. From personal experience, we know that insisting that the markets are always equally obvious in their behaviour, is a very good way to end up in bad trades and lose money. So, we’ll see what the future holds and what we can provide to our subscribers in the next market phase. If you want to read our EUR/USD-analysis (and analysis updates on many other financial markets) as we publish them, and not in our summaries bi-monthly or quarterly summaries, you need to be an active subscriber to our Global Elliott Wave Coverage subscription service.